Agartala, Oct 2 : The Agartala-Dhaka bus service, which was temporarily suspended in the wake of torching of the 'Moitree' bus of Tripura Road Transport Corporation (TRTC) by a mob at Narsingdi in Bangladesh on September 21 last resumed on Monday, official sources said. Another bus left for Dhaka from Agartala international bus terminus today, the sources said. The 'Moitree' bus had faced mob wrath during a political clash in the area. A two-member team of TRTC visited Narsingdi, 70 km from Agartala, on September 25 to lodge a formal complaint with the police there and to conduct an inquiry into the incident, sources said. 'Moitree' is insured and an inquiry was necessary to make a claim for the insurance. The team brought back the damaged bus. 'Moitree' plies from Agartala to Dhaka on Mondays, Wednesdays and Fridays, while 'Shyamoli' from Bangladesh side, shuttles during rest of the week, excepting Sundays. The authorities had to discontinue the service of 'Moitree' due to lack of spare parts as the only other spare bus was being repaired, the sources said. Moitree, with 12 Indians and 10 Bangladeshis on board, was torched by a mob who could not make out it was the bus from the neighbouring country, Indian High Commissioner in Dhaka Pankaj Saran had informed Tripura Chief Secretary Sanjoy Kumar Panda. 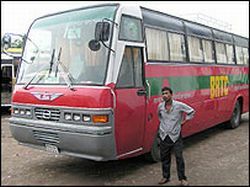 The Agartala-Dhaka bus service started in September 2003.